Dr. Mark George, President and CEO of the Music Institute of Chicago, has been named chair of the board of directors of the Suzuki Association of the Americas (SAA), a not-for-profit organization officially licensed to support, guide, and promote Suzuki education in North, Central, and South America. The SAA aspires to improve the quality of life in the Americas through Suzuki education, seeking to create a music learning community that embraces excellence and nurtures the human spirit. In addition, Gilda Barston, Music Institute cello faculty member and dean emeritus, has been appointed chief executive officer of the International Suzuki Association (ISA), which serves as a coalition of Suzuki Associations throughout the world. The ISA exists to encourage, promote, enlarge, and coordinate Suzuki education and maintain the highest standards of educational instruction. "The SAA is celebrating its 40th anniversary," George noted, "and this is a great time to recognize the remarkable accomplishments of Suzuki education in the Americas. Hundreds of thousands of students and families have been touched by the teachings of Shinichi Suzuki, and instrumental music education has seen a radical shift in the United States. Forty years ago, music educators had low expectations for most children, with special attention reserved for the so-called gifted or talented students. Today, largely because of the influence of Suzuki teachers, it is widely recognized that, with excellent teaching and support, all children can play in tune, make a beautiful tone, and produce sophisticated music." "There are more than 250,000 people worldwide engaged with Suzuki education," said Gilda Barston. "Suzuki students learn to play music while building strong character traits that will serve them in every walk of life." "The Music Institute of Chicago has one of the largest and most successful Suzuki programs in the world," added George. "We are proud and honored to take on these important international leadership roles." 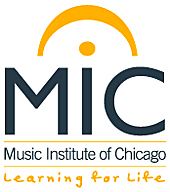 The Music Institute of Chicago has one of the largest and most comprehensive Suzuki programs in the Midwest. The internationally recognized Suzuki method is based on the philosophy of Dr. Shinichi Suzuki, who believed that musical talent can be developed in every child. Students can begin Suzuki instruction as early as three years of age. Music Institute teachers are members of the Suzuki Association of the Americas and provide the highest quality private and group-class instruction. Additional Suzuki opportunities include a series of mid-winter weekend workshops and the summer Chicago Suzuki Institute, which offers a concentrated week of master classes, group instruction, concerts, and enrichment activities. More than 40 Music Institute faculty members offer Suzuki instruction for piano, violin, viola, cello, string bass, guitar, harp, recorder, and flute. The Music Institute of Chicago has announced the establishment of six new Academy Fellowship positions. The prestigious Fellowships will be named for the generous benefactors who have provided full underwriting for the new program: Kathy and Gerhard Bette (Chicago), Susan and Richard Kiphart (Chicago), Betsey and John Puth (Winnetka) and the Sage Foundation of Brighton, Michigan. Auditions for highly qualified pre-college string players and pianists ages nine and up take place Wednesday, August 31 at the Winnetka campus of the Music Institute of Chicago, 300 Green Bay Road. Each Academy Fellow will receive a full tuition scholarship for study in the Academy and have exclusive opportunities to perform and coach with an array of world-class guest artists. Fellowship recipients also will receive benefits such as free professional recording and piano accompanying services. John Cameron, baritone; Maureen Forrester, contralto; Sir Thomas Beecham, Beecham Choral Society, Royal Philharmonic Orchestra. EMI 50999 0 94653 2 9 (2-disc set). There is no mistaking the music of Frederick Delius (1862-1934). He was an English pastoral impressionist who created bucolic images of quiet moods and lingering beauty. His works persist in the mind long after one hears them. True, many of his melodies can sound alike, but, then, one can say much the same of the music of Mozart or Haydn or Vivaldi or any other great composer. Listening to Delius is like floating gently down a stream in springtime, with nowhere special to go and nothing more to do than enjoy the ride. Delius's music meanders peacefully to and fro, with no intent on getting anywhere at any particular time. Lazy music? Certainly not. Let's say it's music for a lazy day, but by no means lazy in construction or execution. At the turn of the twentieth century, hardly anybody had heard of Delius. Then British conductor Sir Thomas Beecham (1879-1961) came to his rescue, seeing in the music of the neglected composer a source of unusual distinction and romance. Over the course of the next fifty-odd years, Beecham would champion Delius to a degree unprecedented in the musical world. When Beecham died in 1961, some people worried that Delius's music might die with him, but that hasn't been the case. 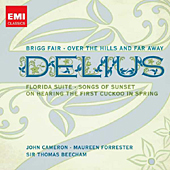 This 2011 reissue from EMI of Favourite Orchestral Works, along with continued releases from Chandos, Naxos, Decca, ASV, Dutton, Unicorn, EMI, and others, demonstrates that the public still demands to hear Delius's material. It's just that no other conductor quite understands the music as well as Beecham did. The present two-disc set offers Beecham's stereo Delius recordings, and they make a pretty good case for the composer's worth. The titles of the pieces say it all: "Over the Hills and Far Away," "On Hearing the First Cuckoo in Spring," "Summer Night on the River," "A Song Before Sunrise," "Brigg Fair: An English Rhapsody," "Florida Suite," "Summer Evening," "Marche-Caprice," "Dance Rhapsody No. 2," "Fennimore and Gerda--Intermezzo," "Irmelin Prelude." Even "Sleigh Ride," which sounds as though it's going to be a fast and exciting romp, turns into a placid ramble. The second disc ends with "Songs of Sunset," eight lovely vocal/choral/orchestra tracks with baritone John Cameron, contralto Maureen Forrester, and the Beecham Choral Society teaming with Beecham and his Royal Philharmonic to conclude the program in high style. Of the many Delius recordings on the market, it is still those of Beecham that reign supreme. He imparts to the music a perfect magic, making every performance sparkle, helping the music to convey all the delicate, tranquil, sometimes vivacious atmosphere the composer intended and more. The 1956-57 recordings, the last of many Delius recordings Beecham made in his lifetime, these in stereo, hold up nicely, continuing to impart a transparency that shames many of today's digital efforts. While this is not to say they couldn't sometimes benefit from a greater weight and range, they do sound better than they have any right to sound. The folks at EMI have released all of the recordings in the set before in various single and double-CD editions, but I believe this is the first time the company has put all of them together. At a very low price, the set makes a terrific way to start a Delius collection if one hasn't already begun one. 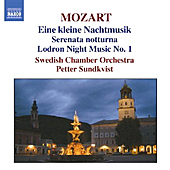 Also, Serenata notturna; Lodron Night Music No. 1. Petter Sundkvist, Swedish Chamber Orchestra. Naxos 8.557023. How can anyone put the knock on Mozart, especially in something so familiar and so deservedly popular as his Serenade No. 13 in G major, K. 525, Eine Kleine Nachtmusik (A Little Night Music), no matter what the orchestra or record company? But when the performance and sound come up as felicitously as these do, and at so low a price, there's nothing to do but sing the disc's praises. Petter Sundkvist and his Swedish Chamber Orchestra give us a lovely, relaxed interpretation of Nachtmusik that makes a thankful contrast to many of the more hard-driven readings we've had in the last couple of decades, especially from the period-instruments crowd. The opening Allegro sets a proper tone by not trying to catch our attention as an overture might; and it's followed by the loveliest of Romances, tender and tranquil without ever being overly brooding, sentimental, or cloying. The Minuetto is sprightly, and the Finale is energetic. What more could we want from this string piece? Well, to answer my own question, perhaps Sundkvist could have used a touch more sparkle or wit, in the manner of Willi Boskovsky and the Vienna Mozart Ensemble on Decca, which is still my touchstone for this work. But Boskovsky, while more incisive, is less easygoing, and, frankly, Sundkvist's casual charm goes a long way with me. Of the two accompanying works, I thought the Serenade No. 6 in D major, K. 239, Serenata notturna, a bit too bass heavy in the timpani to do full justice to the work's allures; but except for some equally heavy and somewhat clouded horns in the hunting sections of the Divertimento No. 10 in F major, K. 247, Lodron Night Music, this final piece comes off almost as well as the Nachtmusik. The sound the Naxos engineers provide is as good as anything you'll find at the price. It spreads out nicely across the front speakers, provides decent definition everywhere but in the aforementioned timpani and horns, and exhibits a remarkably realistic resonant glow, a hint of reverberation that gives the performances a most realistic feel. In all, this album is a hands-down easy recommendation. Dave Grusin, Ron Carter, Lee Ritenour, Harvey Mason, Larry Bunker. LIM XR 002. What do you mean, it's not classical music? It's jazz, and jazz is always classic. Especially when it's done by American composer, arranger, and pianist Dave Grusin. Besides, Grusin has not only written and arranged songs and soundtracks for Oscar-winning films like The Graduate and Tootsie and won an Oscar for The Milagro Beanfield War, he's done crossover albums of classical music as well. With credits for over a hundred films and a multitude of record albums, the guy is a class act all the way around. 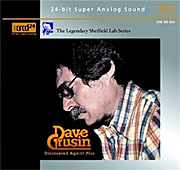 Dave Grusin: Discovered Again is a 1976 recording remastered to audiophile standards on compact disc by producer Winston Ma's label, LIM (Lasting Impression Music). The thing is, it was an audiophile LP to begin with, a direct-to-disc production made originally by Sheffield Lab. The idea back then was to record a music session directly to the master lacquer, from which the company would strike a limited number of vinyl LPs, with no tape master involved. The dynamic range and impact of those direct discs provided a striking realism when played back on a good stereo system, probably as close to the live performance as one could get in the home. But they were also expensive and obviously appealed only to a small number of hi-fi buffs around the country. Eventually, CD's overcame vinyl in the marketplace, and Sheffield found it hard to continue with a diminishing fan base. I remember reviewing all of Sheffield's direct discs back in the Seventies and early Eighties and loving them dearly. I also remember being disappointed when Sheffield began releasing their tape backups on CD; they never sounded as dynamic as their vinyl counterparts. So when LIM decided to give the tapes another shot on compact disc, this time in the XRCD process, I thought it was about time to revisit this great old album. Joining Grusin on a Steinway piano and Fender Rhodes electric piano are Ron Carter, bass; Lee Ritenour, guitar; Harvey Mason, drums; and Larry Bunker, percussion. They make a tidy, well-knit ensemble. The program begins with "A Child Is Born," quiet, soft, with fine bass playing, a clear, taut piano sound, and just a hint of percussive support. "Keep Your Eye on the Sparrow" comes next, probably the most well-known work on the album because of its use in the old Baretta TV series. It's a faster, more up-tempo piece than the preceding track, with firm bass thumps, excellent, extended highs, and superclean transient response. "Sun Song" features superb piano and percussion sound, and it's one of Grusin's sweeter melodies, building as it goes along. Then, there's "Captain Bacardi," a sambo from Antonio Carlos Jobim, among the most-exciting music on the disc, performed joyfully by the players. It makes for the kind of demo material audiophiles are so fond of using to impress friends and neighbors. Next come three cowboy songs: "Git Along Little Doggies," "The Colorado Trail," and "Cripple Creek Breakdown," making a terrific set of variations on the familiar tunes. The original album ended with "Adeus A Papai," a piece Grusin wrote as a farewell to his father. Here, in addition, because the CD allows more space than the LP did, we get four previously unreleased alternative takes: "Keep Your Eye on the Sparrow," which I actually like better than the one from the direct disc for its being cleaner and more spontaneous; "Sun Song," "Git Along Little Doggies," and "The Colorado Trail." In the JVC XRCD24 process, "the analog signal is taken directly from the custom mastering console and digitized via JVC's K2 24-bit Analogue-to-Digital Converter. The 24-bit digital word then passes through JVC's Digital K2, which regenerates a pure 24-bit digital signal that is recorded to a Sony PCD-9000 magneto-optical disk. The XRCD process takes advantage of the stability of the magneto-optical disk, as well as its 24-bit capacity by using it as the audio storage medium for delivery to manufacturing." From there, the JVC manufacturing plant plays back the 24-bit signal through the Digital K2 to eliminate any jitter and distortion and then converts the 24-bit signal to 16 bits using K2 Super Coding, "which ensures true 16-bit dynamic range. The 16-bit signal is then EFM encoded, and sent to a high-precision DVD K2 Laser," with "Extended Pit Cutting technology." And so on, with the use of a K2 Rubidium Clock and a special Master Stamper. It's a demanding process that obviously yields the best possible results. So, in the final analysis, does this 24-bit super-analog remastering sound better than Sheffield's old direct-to-disc vinyl LP? No. LIM made this CD, after all, from tape backups, not from the original lacquer master. It doesn't have quite the dynamic punch of the old LP. However, the good news is that this XRCD24 sounds better than anything Sheffield ever put on CD and as good as anything you can buy on compact disc from any manufacturer. While the recording is a touch dry, with only a moderate perception of depth among the five players, these were always minor concerns of the original Sheffield production. Nevertheless, the transient quickness is superb for a compact disc, the dynamic range is wide, the bass is taut, and the clarity is outstanding. Moreover, for the listener interested primarily in the music, with the XRCD24 you don't have to put up with the ticks and pops of a vinyl LP. Put this release in the compact-disc audiophile class and have fun with the sound, the music, and the performances. For more information about LIM (Lasting Impression Music) and FIM (First Impression Music), you can visit their Web site at http://www.firstimpressionmusic.com/. Concertos for flute, oboe, violin, bassoon, and strings. Katy Bircher, flute; Gail Hennessy, oboe; Peter Whelan, bassoon; Adrian Chandler, La Serenissima. Avie AV 2218. For those listeners who have convinced themselves that Antonio Vivaldi (1678-1741) rewrote the same concerto 800 times, the period-instruments group La Serenissima, lead by their founder Adrian Chandler, make a convincing argument to the contrary. 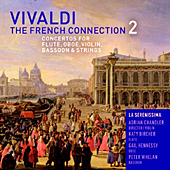 Following up their Gramophone award-winning album The French Connection, La Serenissima's second collection of Vivaldi concertos in the French style is an eye-opening, ear-flattering delight from start to finish. So, what exactly is the "French style"? That's a bit uncertain, it seems. What is clear, though, is that in Vivaldi's time the influence of Italian music in France was strong, and as a result Italian composers like Vivaldi adapted some of their music to appease French tastes. Likewise, French music adopted some of the Italian style, so it's hard to tell which country most affected the other. In any case, according to Maestro Chandler you will hear variously in the nine concertos presented on the disc examples of "French overture-like flourishes," Bourrées (French dances), an invitation to "more galant execution of appoggiaturas and trills," further French dance-like characteristics, and an emulation of "French sonority" in "quieter, sweeter sounds." While it is difficult to single out favorites among the program's nine selections, two of which are world-première recordings, there are three concertos I found particularly charming, all three featuring solo instruments. The first is the Concerto for violin, oboe, strings and continuo in F, RV 543, with Gail Hennessy playing oboe; the second is the Concerto for flute, strings and continuo in A, RV 440, with Katy Bircher on flute; and the third is the most interesting of all, the Concerto for bassoon, strings and continuo in C, RV 473, with Peter Whelan on bassoon. Remarkably, Vivaldi wrote thirty-nine concertos for bassoon; if even a few of them were as attractive as this one, it would be all the more extraordinary, indeed. The two world-première recordings are of the Concerto "Il Gran Mogol" for flute, strings and continuo in D, RV 431a, which researchers only recently found in the National Archives of Scotland; and the Concerto for violin, strings and continuo, RV 365, for which Chandler uses the earlier of two finales and slightly modifies the slow movement according to the composer's initial intentions. This second of the world premières is an especially lovely work all the way around. Perhaps the most unusual piece on the program, however, is the Concerto "Intitolato La Notte" for flute, two violins, bassoon and continuo in G, RV 104. Vivaldi wrote it in five movements, using both flute and bassoon in the mixture and beginning with a Largo rather than a traditional Allegro. This piece also contains some of the most-playful and most-solemn movements on the disc, making it a piece of music I'm sure Disney might have enjoyed animating for another Fantasia. Anyway, as I say, it's hard to choose favorite pieces because they're all so well played. Chandler and La Serenissima play with such finesse, such precision, and yet such rollicking good fun, they make every work on the disc sparkle and come alive. Nor do they need to do it by galloping full speed ahead as some other period-instruments groups do in their pursuit of "authentic" period practices. La Serenissima's performances always sound comfortable; never cozy or stuffy or sentimental, but just right, just the way you might hum or whistle the pieces (if that was your idea of a good time). They play with animation, resilience, good sense, and passion. It's a winning combination. Avie recorded the music at the Hospital of St. Cross, Winchester, England, in February, 2011, obtaining their usual excellent results. The sound is at once warm and smooth yet firm and detailed. Unlike some period-instruments recordings that can sound harsh, strident, or excessively bright, these recordings sound tight and natural, with a pleasant acoustic glow around the instruments making them appear all the more realistic. Taken together--performances and sound--the album makes another enjoyable treat from La Serenissima, a name, incidentally, that the ensemble borrowed from "La Serenissima Repubblica di Venezia" (or "The Most Serene Republic of Venice"). Certainly, they play serenely, with unruffled good cheer. After conducting on-site auditions in the cities of New York, Cleveland, London, and Munich, the Cleveland International Piano Competition proudly welcomes an international roster of contestants to this year's competition, running July 27 through August 7. With twenty-eight pianists from eleven countries, Cleveland's impeccable reputation for prestige, fairness, and dedication to creating a positive competition environment continues to attract a field of highly qualified applicants from across the globe, perpetuating its standing as one of the most prestigious piano competitions in the world. Several distinctions set the Cleveland International Piano Competition apart from other piano competitions: The first-prize cash award of $50,000 is one of the largest prizes of any piano competition in the world. The Competition's partnership with The Cleveland Orchestra--which performs with contestants in the final round--represents the highest caliber or collaboration present in any piano competition. The Competition's unwavering commitment to providing an atmosphere free of distractions or disruptions allows contestants to perform at their best, and continually sets Cleveland apart as a competition aimed first and foremost at providing positive experiences for all competitors. Now in its thirty-sixth year of existence, the Cleveland International Piano Competition possesses an eminent list of alumni, and winners benefit from an array of professional opportunities following the competition. The Competition's 2009 winner Martina Filjak has enjoyed a hugely successful career since her victory, performing nearly 100 solo and orchestral engagements worldwide over the past two years. Additional winners from past years include such notable artists as Jean-Yves Thibaudet, Angela Hewitt, and Sergei Babayan. During the competition's ten days of performances, solo rounds are held twice daily for the first eight days. Candidates are eliminated over this period by vote of the jury until four finalists remain. Finalists perform with the Cleveland Orchestra over a two-night period and the winner is announced at the conclusion of the last performance. A celebration gala is held on the final night of the performances. For additional information; contestant's photographs, biographies and repertoire; and jury biographies, please visit the Competition's Web site at http://www.clevelandpiano.org. Tickets for performances range from $15 to $75. Recital rounds, performed at The Cleveland Play House, can be purchased at the Play House ticket office at 216-795-7000 or www.clevelandplayhouse.com. Tickets for the final rounds, performed at Severance Hall, can be purchased at the Severance Hall ticket office at 216-231-1111 or www.clevelandorchestra.com. North Bethesda, MD, July 19, 2011: The National Philharmonic is proud to announce that the 2011 winner of the XIV International Tchaikovsky Competition--pianist Daniil Trifonov--will perform Tchaikovsky's Piano Concerto No. 1 with the Philharmonic, led by Music Director and conductor Piotr Gajewski, on February 4, 2012, at 8 p.m. and on February 5, 2012, at 3 p.m. at the Music Center at Strathmore. Held every four years in Moscow, the Tchaikovsky Competition includes the disciplines of piano, violin, cello and voice. In past years, the piano category has been won by such legends as Van Cliburn and Vladimir Ashkenazy. This month, the International Tchaikovsky Competition awarded pianist Trifonov First Prize, a Gold Medal, the special prize for Best Performance of a Mozart Concerto and the Audience Choice Award. On the final day of the competition, he was selected as the Grand Prize winner. 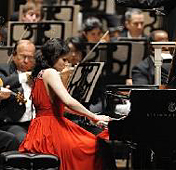 The Tchaikovsky Competition triumph is the crowning achievement of a series of awards garnered by Trifonov, who in May won First Prize and Gold Medal at the 13th Arthur Rubinstein International Piano Master Competition in Tel Aviv and in 2010 won third prize in the 16th International Fryderyk Chopin Piano Competition in Warsaw. Born on March 5, 1991 in Nizhny Novgorod, Daniil Trifonov is a graduate of the Gnesin School of Music in Moscow, where he studied with Tatiana Zelikman. Since 2009, he has been studying with Sergei Babayan at the Cleveland Institute of Music. In 2008, he won first prize in the San Marino International Piano Competition and fifth prize in the International Scriabin Competition in Moscow. 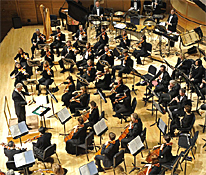 As the Music Center at Strathmore's ensemble-in-residence, the National Philharmonic showcases world-renowned guest artists in time-honored symphonic masterpieces conducted by Maestro Gajewski and monumental choral masterworks under National Philharmonic Chorale Artistic Director Stan Engebretson. Tickets for the All Tchaikovsky concerts on February 4, 2012 at 8pm and on February 5, 2012 at 3 pm at the Music Center at Strathmore are now available as part of National Philharmonic's 2011-2012 subscription season. To purchase, please visit nationalphilharmonic.org or call the Strathmore ticket office at (301) 581-5100. Kids 7-17 are free through the "All Kids, All Free, All the Time" program (sponsored by The Gazette). "All Kids" tickets must be purchased in person or by phone. In addition, parking is free. Attached is a photo of pianist Daniil Trifonov (photo credit Vadim Shults). On July 28 at 7:00 pm (local times), the Israel Philharmonic Orchestra will perform a one-time event, LIVE FROM JERUSALEM, honoring the legacy of the great American opera star, Richard Tucker. Conducted by Zubin Mehta and featuring soprano Renée Fleming and tenor Joseph Calleja, the concert will be cinecast to over 480 movie theaters nationwide and features such mainstays in the operatic literature as Gounod's "Jewel Song" from Faust (Fleming), Verdi's "Parigi, o cara" from La Traviata (Fleming and Calleja), Puccini's "E lucevan le stelle" from Tosca (Calleja), and other arias by opera's greatest composers. The majestic LIVE FROM JERUSALEM" concert will be shown in a 'Delayed Live Broadcast.' Visit www.fathomevents.com to find a theater in your area. Also, Triple Concertos, BWV 1044 and 1064. Peter Schreier, CPE Bach Chamber Orchestra. Newton Classics 8802075 (2-disc set). Newton Classics is the record company that reissues older material and releases it on fresh new discs. Usually, they choose recordings of critical or popular distinction that for whatever reason have gone out of print. 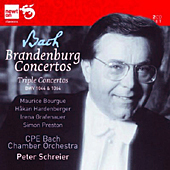 In the case of conductor Peter Schreier's performances of Bach's six Brandenburg Concertos with the CPE Bach Chamber Orchestra, originally a Philips set from 1993, the case seems a little different. It's a recording that initially went by without much notice from the critics or the public. My own recollection of it had been one of indifference. Listening to it again in this 2011 Newton re-release, I can understand my lack of interest back then. You will recall that the six Brandenburgs sound different from one another because J.S. Bach never intended they be played as a group, as a unified cycle. In fact, Bach himself called them "concerts," and it wasn't until the mid nineteenth century that people began referring to them as "concertos." Margrave Christian Ludwig of Brandenburg commissioned Bach to write several pieces for him, and what he got a few years later was the collection of six works we know today as the Brandenburg Concertos, the pieces written for various-sized groups and various solo instruments that Bach had probably composed at various times for various other occasions. Concerto No. 1 is among the lengthiest of the Brandenburgs, four movements (in the French style) rather than three, and Bach arranged it for the biggest ensemble. It's also my least favorite. Under Schreier we hear fine playing but fairly monotonous, singsong rhythms. Schreier restrains it to the point of its being more-or-less humdrum. The concluding Allegro and Minuet come off well, the dances displaying a sweet lilt, but even here the lack of imaginative variety gets a bit wearisome. Concerto No. 2 is one of the most popular in the set, highlighting the oboe, recorder, violin, and trumpet, the latter getting the bulk of the playing time. It is also among the most vivacious of the six concertos, but Schreier takes it at such a quick pace, with the trumpet so brightly lit, it's kind of abrasive, actually. Although the slow center section works well enough, Schreier continues his brisk tempos in the final movement, almost ruining what went before. Listeners may enjoy Concerto No. 3 as well as they like No. 2, maybe more so. Here, Schreier and his players show a good deal of spirit, and the conductor sounds as though he's having a little more fun, at least in the first movement. By the time he gets to the concluding Allegro, however, it's off to the races again, with speeds that seem out of character with those of the other two movements. The piece loses subtlety and nuance as it goes along. Concerto No. 4 is probably the most playful, with the soloists darting in and out of the structure, and Schreier and his ensemble make the most of it. This delightful little concerto sounds splendid under Schreier's direction, with every note and phrase oozing charm. I'm not sure why Schreier was so inconsistent about how he wanted these things done, but here he seems spot on. In Concerto No. 5 the harpsichord and flute are the stars, with the violin adding a felicitous touch. Again, the tempos seem more routine than necessary, although they don't detract too much from Bach's intentions. Even though Concerto No. 6 is for me the least-distinctive work of the set and uses the smallest group of players, it doesn't usually feel small. Despite a shaky opening movement, it is one of Schreier's more successful performances, with only the slightly weighty sonics tending slightly to distract from the intimacy of the music. The set places Concertos 1, 3, and 6 on the first disc, these being the pieces that establish dialogues between instrumental choirs answering one another. On disc two we get Concertos 2, 4, and 5, which highlight more solo playing. Fair enough. In addition to the six Brandenburg Concertos we get the two triple concertos (BWV 1064 for three violins, strings, and continuo and BWV 1044 for harpsichord, violin, and flute). They appear a touch more open and extended than the Brandenburgs, giving the interpretations more life. As before, the players perform well, with 1044 coming off best. The sound, which Philips recorded in April and September of 1992, is distinctly warm and just a tad heavy. The instruments are well spread out across the stage but with only moderate depth among them. While the recording doesn't offer the very best definition, it is smooth and easily listenable. I would have liked a little more sparkle, although I have no serious complaints. Given the wide variety of fine Brandenburg recordings available, it seems to me a person can find one or more to fit almost every taste. My own favorites include those by Trevor Pinnock and the European Brandenburg Ensemble (Avie) and the English Concert (DG Archiv), Neville Marriner and the Academy of St. Martin-in-the-Fields (Philips), Gustav Leonhardt and his Ensemble (Sony), Christopher Hogwood and the Academy of Ancient Music (L'Oiseau-Lyre), Raymond Leppard and the English Chamber Orchestra (Philips), Jordi Savall and Les Concert des Nations (Astree), and others. There are more than enough to choose from unless one is an avid collector and simply has to own every recording possible. Theme and Variations; Prokofiev: Piano Concerto No. 1 and Suggestion diabolique; Balakirev: Islamey. 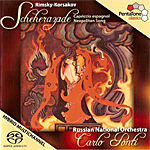 Andrei Gavrilov, piano; Riccardo Muti, Philharmonia Orchestra; Simon Rattle, London Symphony Orchestra. EMI 7243 5 86881-1. I suppose there's an advantage to getting older. It seems like just yesterday that young Russian pianist Andrei Gavrilov recorded these items, and you had to pay full price to get them on separate vinyl LP's. Now Gavrilov is over thirty years older (while the rest of us have obviously remained the same), and we can buy both recordings on a single budget-priced CD. Time does pay its dividends. The album leads off with Tchaikovsky's Piano Concerto No. 1, probably because of the two piano concertos included it's the better known and the bigger draw, but it's really the Prokofiev that rewards the listener the most. The Tchaikovsky is certainly big and energetic, as it should be, with a somewhat overly dramatic opening movement, a sweetly hushed second movement, and thrillingly dynamic conclusion. Yet EMI's 1979 sound (digitally remastered in 1985) places the piano a bit close, and the overall balance is rather midrange heavy. Although the result may not be entirely natural or realistic, it's all right. The Prokofiev Piano Concerto No. 1, on the other hand, is brilliant throughout, Gavrilov in the first movement zipping all over the map, astounding audiences in his day as much as when performers were first confounding listeners with the piece in the early part of the twentieth century. Then Gavrilov moves gracefully into the rhapsodic second movement and back again to the turbulent and triumphant finale. The recording, which EMI made in 1977 and digitally remastered in 1992, sounds better balanced than the Tchaikovsky, the piano seems better integrated into the whole, and the bass is fuller. 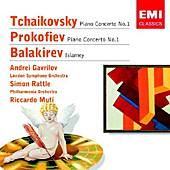 Gavrilov plays the various solo pieces coupled to the piano concertos exceptionally well, too (and it's a wonder the pianist had any fingers left after the Balakirev), making this cheapie disc an instant best-buy. Also, William Schuman: A Free Song; Leo Sowerby: The Canticle of the Sun. Carlos Kalmar, Grant Park Orchestra and Chorus. Cedille CDR 90000 125. 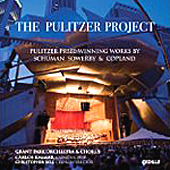 Titled The Pulitzer Project, this 2011 album from Cedille Records features three compositions that won Pulitzer Prizes in the mid Forties, two of them world première recordings. Yes, I know what you're thinking: How is it possible that record companies haven't recorded two Pulitzer Prize-winning pieces of music before now? Well, frankly, as good as they are, they aren't highly accessible, and I can only suppose that most record companies weren't sure they'd sell. Indeed, it may be why Cedille chose to include Copland's Appalachian Spring along with them to ensure the disc's success. Surprisingly, perhaps, given that the Pulitzer committee has been handing out awards since 1917, they only started giving prizes for music in 1943. The criterion is "for a distinguished musical composition by an American that has had its first performance or recording in the United States during the year." That first year, 1943, they awarded the prize to William Schuman (1910-1992) for his brief, thirteen-minute, two-movement work A Free Song, which begins the program. Schuman wrote A Free Song for orchestra and chorus, basing it on a poem, "Drum Taps," by American poet Walt Whitman. A press release for the music's original publication announced that "grace and charm are crowded out by the impact of granite-like blocks of dissonant harmony and sharp-edged counterpoint." With publicity like that, it's no wonder no one recorded the music until now. It's not as bad as it seems, though, and under Maestro Carlos Kalmar's deft direction, some of that sharp edge feels diminished. While it is still not an easy piece of music to live with, it makes a strong, if brief, curtain raiser, acting as a kind of overture to the rest of the program. The centerpiece of the album is Appalachian Spring by Aaron Copland (1900-1990), a piece that won the Pulitzer in 1945. It's familiar enough for most of you probably to own several different recordings of several different versions of it. It's available in its complete, original chamber version, complete orchestral version, and popular suite, which is what we get here. My own favorite recordings have been those by Michael Tilson Thomas (RCA), Leonard Slatkin (EMI), Leonard Bernstein (DG), Antal Dorati (Decca), and, most of all, by the composer himself (Sony). However, this new recording by Carlos Kalmar fits in nicely with the best of them. Among the adjectives I wrote down as I was listening were graceful, easygoing, gentle, smooth, light, folksy, breezy, charming, amiable, cozy, and neighborly. It's quite the moving interpretation, and, as I say, places it among the best readings available. The final work on the program is The Canticle of the Sun by Leo Sowerby (1895-1968), the piece winning the prize in 1946. Sowerby based his eleven-movement suite for orchestra and chorus on English writer Matthew Arnold's translation of the St. Francis of Assisi poem. Its orchestral prelude adopts a rather lofty tone, followed by an equally grandiose entry from the chorus. The mood lightens considerably as it goes along, although it tends to alternate august, sweeping sections with soft, serene, flowing ones, and not a few hectic, stormy ones in between. Kalmar probably does what he can with the music, but it may not appeal to every listener despite some lovely passages. Cedille recorded the music "in concert at the Harris Theater for Music and Dance in Millennium Park, Chicago, June 25 and 26, 2010." I didn't really like the thought of that "in concert" business because even though live performances can sound fine, they often don't sound as good as they might have sounded in the studio or without an audience. In the case of this Cedille recording, it is good, but it is not quite as good as I'd liked. First, it sounds fairly close up, probably to minimize audience noise. It does its job in this regard quite well. Along with the absence of any annoying applause, the miking picks up little or no distracting audience commotion. Second, it sounds big, widely spread out, and slightly forward. There are times when it also sounds a bit thin and hard compared to Cedille's best work, occasionally favoring the upper midrange. However, a wide dynamic range and some solid impact help to add needed realism to the occasion. Also, Elegia eroica. Francesco La Vecchia, Orchestra Sinfonica di Roma. Naxos 8.572415. Alfredo Casella (1883-1947) was an Italian composer, pianist, critic, conductor, and teacher who produced a good deal of music during the first half of the twentieth century. Yet record companies these days seldom produce much by him, and major orchestras seldom play his works. His Third Symphony was a success at its première and for a few years thereafter, and then it dropped out of sight. Did it deserve the neglect? Perhaps. Casella called his Symphony No. 3, Op. 63 (1939-40), simply Sinfonia, perhaps to distinguish it from his first two symphonies, the last of which he wrote some three decades earlier. After No. 2 he apparently had no intention of ever writing another symphony, but he accepted a commission (along with a number of other composers) from the Chicago Symphony to celebrate their fiftieth anniversary, and the work he began sort of got out of hand on him, growing into a full-fledged symphony of four interconnected movements before he knew it. 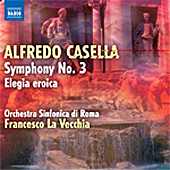 Naxos, with Maestro Francesco La Vecchia and the Orchestra Sinfonica di Roma, have already recorded Casella's first two symphonies, so this disc wraps up the man's symphonic output. La Vecchio takes the opening Allegro of No. 3 at a steady gait, building pressure as it goes along. This movement establishes an agitated, somewhat dissonant mood, leading to a quiet Andante that rather creeps up on the listener. Casella had studied music with Gabriel Faure and among his fellow students and later acquaintances were Maurice Ravel, Gustav Mahler, Igor Stravinsky, and Richard Strauss. They obviously influenced Casella's early compositions, but we see a shift in this Third Symphony, written late in his career. While the Andante is old-fashioned in its sweet, lyrical aspirations, it displays clearly modern tendencies, with little hint of any Romantic melodies. In fact, it reminds one in this regard of several of the slower sections of Mahler's symphonies. Then we get a brief Scherzo that appears more turbulent than anything in the first movement, with pounding background notes sounding much like something from Shostakovich. After that, the Rondo Finale begins slowly, softly, but menacingly. La Vecchia leads it on an adventurous, rhythmic journey that gets ever more rambunctious as it progresses. After a strongly vigorous climax, the music recedes into relative calm before a brief, jubilant conclusion, perhaps indicating Casella's hope for a triumphant outcome to the Second World War, just underway in Europe. The booklet notes comment on Casella's dedication to Mussolini and Fascism, so the possibility is not entirely out of the question. The program ends with Casella's Elegia eroica ("Heroic Elegy"), Op. 29, from 1916. He wrote it in memory of a soldier fallen in battle in the First World War. It is properly somber, almost to the point of grimness. At once intimate and solemn, it is a kind of funeral dirge for the lost soldier, turning unexpectedly into a lullaby at the end. I found it a more effective work than his Third Symphony for its more passionate tone and its more concise expression. Under La Vecchia, it is a powerful and profound musical experience. Recorded in Rome in 2008 (Third Symphony) and 2010 (Elegia), the sound is typical of the work Naxos usually produce--very clean, very competent, but not quite dynamic enough, extended enough, or transparent enough to place it in the audiophile category. CHICAGO—The Orion Ensemble, Chicago's nationally recognized and critically acclaimed chamber music ensemble, presents Chamber Treasures Meet Chicago Jazz, its 19th season of concerts, featuring Spanish compositions, a tribute to women composers, a jazz-focused program and more. 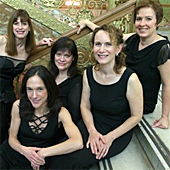 Orion will perform each of its four concert programs at venues spanning the Chicagoland area: Ganz Memorial Hall at Roosevelt University, where Orion is Ensemble-in-Residence at the Chicago College of Performing Arts (Chicago); the Music Institute of Chicago's Nichols Concert Hall (Evanston); and Fox Valley Presbyterian Church (Geneva). The season opens with "Spanish Flair," featuring two piano trios by Catalan composers and two additional early 20th century works. The program includes Trio in C Major for Violin, Cello and Piano (1926) by Gaspar Cassadó; Trio for Clarinet, Violin and Piano (1932) by Aram Khachaturian; Three Pieces for Clarinet Solo (1920) by Igor Stravinsky; and Trio for Violin, Cello and Piano, Op. 50 (1910) by Enrique Granados. Performances take place September 25 (Evanston), October 5 (Chicago) and October 9 (Geneva). "Classical Romance" describes the season's second concert program, featuring three pieces for three instruments each: Trio in B-flat Major for Clarinet, Cello and Piano, Op. 11 by Ludwig van Beethoven; Trio in B-flat Major for Violin, Viola and Cello, D. 581 by Franz Schubert; and Trio in D Major ("Ghost") for Violin, Cello and Piano, Op. 70, No. 1 by Ludwig van Beethoven. Performances are November 20 (Evanston), November 27 (Geneva) and November 30 (Chicago). In honor of Women's History Month, Orion will be "Celebrating Women Composers" in March, performing Silver Dagger for Violin, Cello and Piano (2009) by Stacy Garrop; Trio in E-flat Major for Clarinet, Cello and Piano, Op. 44 by Louise Farrenc; Air and Variations for Violin, Clarinet and Piano (1957) by Phyllis Tate; and Trio in D Minor for Violin, Cello and Piano, Op. 11 by Fanny Mendelssohn. Performances are March 4 (Geneva), March 11 (Evanston) and March 14 (Chicago). Guest pianist Miguel de la Cerna contributes a work commissioned for Orion and performs with the Ensemble for the final program, "All That Jazz! ", which also features Quartet in C Minor for Violin, Viola, Cello and Piano, Op. 15 by Gabriel Fauré and Rhapsody in Blue for Clarinet and Piano (1924) by George Gershwin, arranged by Timofei Dokshitser. Performances are May 6 (Evanston), May 9 (Chicago) and May 13 (Geneva). Also during the season, Orion will appear on the broadcast series "Live from WFMT" December 5, 2011 and March 12, 2012 and in the Chicago Cultural Center's Lunchbreak Series "Classical Mondays" October 31 and November 21, 2011. Orion also tours, performing in chamber music series across the country. Its most recent CD is Twilight of the Romantics. The Orion Ensemble performs each concert program during the 2011–12 season at three Chicago-area venues: Roosevelt University's Ganz Memorial Hall, 430 S. Michigan Avenue in Chicago on Wednesdays, October 5, November 30, March 14 and May 9 at 7:30 p.m.; the Music Institute of Chicago's Nichols Concert Hall, 1490 Chicago Avenue in Evanston on Sundays, September 25, November 20, March 11 and May 6 at 7:30 p.m.; and Fox Valley Presbyterian Church, 227 East Side Drive in Geneva on Sundays, October 9, November 27, March 4 and May 13 at 7 p.m. Single tickets are $26, $23 for seniors and $10 for students; children 12 and younger are free. A four-ticket flexible subscription provides a ten-percent savings on full-priced tickets. For tickets or more information, call 630-628-9591 or visit orionensemble.org. Also, Hebrides Overture. Otto Klemperer, Philharmonia Orchestra. HDTT HQCD233. German conductor and composer Otto Klemperer had a career that spanned some seven decades, a career that went so far back he knew and was friends with Gustav Mahler. However, audiences today probably know him best from his stereo recordings with the Philharmonia and New Philharmonia Orchestras, a tenure that lasted from 1959 until his retirement in 1971 and resulted in any number of fine recordings. Although he was a conductor whom millions of people loved, he also garnered much negative criticism. Many people continue to view him as too old fashioned, too rigid, too monumental a conductor, his music-making too ponderous and slow. Certainly, that last criticism is valid. He did offer up slower tempos as he got older, largely because he enjoyed shaping every musical phrase meticulously, taking his time about letting the music unfold as the notes informed him, often making them come alive with a strength and concentration listeners had seldom heard before. People also sometimes say his performances were unsmiling, that his interpretations were without wit or charm. To this latter criticism, I would sincerely disagree. Klemperer gave us some of the most-buoyant, most-delightful renditions possible of the German and Austrian repertoire he knew so well, particularly the music of Beethoven, Brahms, Haydn, Mahler, Mendelssohn, Mozart, Schubert, Schumann, and Wagner. Many of his recordings of these composers are among my favorites by anyone. Which brings us to his Mendelssohn, his stereo EMI recordings of A Midsummer Night's Dream and the Symphony No. 4 being for me at the top of the charts. If his reading of the Symphony No. 3, here remastered by HDTT (High Definition Tape Transfers), isn't quite in the same exalted category, it is at least a sweet and loving tribute to the composer's love of lyric Romanticism. Felix Mendelssohn (1809-1847) finished his Third Symphony in 1842, and despite its number, it was the last of the five symphonies he wrote. He referred to it as his "Scottish" symphony and started it over a dozen years earlier after a visit to Scotland. It's not really very Scottish, though; it's more of a brief, musical impression the composer got of the country and expanded upon through the years. Anyway, Klemperer takes the opening movement at a gentle, leisurely, flowing, always melodious gait, which may only serve to reinforce the critics' notion that the man's music making was simply slow. True, the Scherzo that follows does not come off as exuberantly under Klemperer as it does under some of his rivals, but it does maintain the same genial spirit of the preceding section. The third-movement Adagio actually moves along at a relatively quick pace, yet Klemperer never hurries it, keeping it ever graceful and fluid. It's only in the finale that Klemperer truly disappoints, the music never catching fire. While I suppose it's a part of the conductor's grand scheme, it does seem more than a tad lax, lacking much passion. Interestingly, Klemperer recorded the same symphony about a decade earlier in mono, which people claim is a more impetuous, more spontaneous, more high-spirited performance. I haven't heard it, so I can't say. Be that as it may, even though Klemperer makes a strong case for the beauty and eloquence of the Third Symphony, I continue to prefer the recordings of Peter Maag (Decca), Claudio Abbado (Decca or DG), Herbert Blomstedt (Decca), Leonard Bernstein (Sony), Bernard Haitink (Philips), and Andre Previn (EMI) to his. Still, it's hard to knock Klemperer's calm repose. Coupled with the symphony, we find Mendelssohn's Hebrides Overture, also called Fingal's Cave, a concert overture he wrote in 1830, revising and premiering it in 1832. Here, Klemperer shows more energy than he did in the Third Symphony and provides a moving portrait of the island landscape, sea, and waves. Recorded by EMI in 1960 and remastered by HDTT in 2011 on an HQCD, the sound is quite good. Coincidentally, I had on hand for comparison the same symphony recording remastered by EMI Japan in 2010, also on an HQCD. Both discs are splendid, with reasonably wide dynamics, a realistic midrange, and a natural ambient bloom to the acoustic. The differences are that the newer HDTT sounds slightly smoother and fuller to me, with a marginally stronger bass response; and the EMI Japan sounds to a very small degree more open. Nevertheless, both discs could have used a little more sparkle at the top end, possibly the result of noise reduction. After listening first to the entire HDTT disc to appreciate the performances, I switched back and forth between two CD players for the sonic comparison. While the differences I found were not huge, they did, overall, tend to favor the HDTT. Nevertheless, to its credit the EMI-Japan disc comes with Klemperer's outstanding Fourth Symphony as a companion piece, the HDTT only the Hebrides Overture. However, one has to order the EMI Japan all the way from Japan, which isn't the cheapest proposition I can think of. Also, Cello Concerto No. 2; Rondo Tarantella; A Summer Overture. Scott Ballantyne, cello; Takua Yuasa, RTE National Symphony Orchestra of Ireland. Naxos 8.559234. 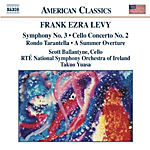 OK, Frank Ezra Levy is not exactly a name that jumps out at you, but he is one of the composers the folks at Naxos showcase in their "American Classics" series. And for good reason. Born in 1930, Mr. Levy has been composing music for the better part of seven decades. This album contains four of his works, mostly world premieres of short pieces, three of them written in the past decade or so. Things begin with his Summer Overture (1997), a sprightly affair with plenty of gusto to get the show rolling. Following that is the more substantial Cello Concerto No. 2 (2002), with soloist Scott Ballantyne. Levy is himself a cellist, so he knows the instrument. The opening Allegro shows a hint of melody, with orchestral support used discreetly, the players sometimes sounding like a chamber group. Levy calls his piece a "kaleidoscope construction," and it certainly runs the gamut of emotional moods. The second movement Adagio works best, a lovely dialogue between soloist and orchestra. However, the final movement breaks out into such exhilarating jubilation, it's hard to tell that it belongs in the same piece. Here you'll find some nice percussive effects, with the cello, oddly, less dominant. Then we get the Rondo Tarantella (2003) from an opera Levy composed called Mother's Day, the abundance of percussion, drums, cymbals, you name it, emphasizing the music's episodic, comic tone. Things close out with the brief, twenty-minute, two-movement Symphony No. 3 (1977). It's the oldest work on the disc, written when the composer was a mere stripling of forty-seven. Again we hear the music's kaleidoscope effect, with themes turning every which way and returning in different guises. The slow dirgelike beginning sets the mood, but it eventually opens up to a lovely, sunny middle section with vaguely Scottish, pastoral inflections. Finally, the symphony returns to a more somber tone, leading to a Vivace conclusion with marchlike cadences. Maestro Takua Yuasa and RTE National Symphony Orchestra of Ireland play all of this with great flourish and sincerity. Moreover, the Naxos sound is fairly advantageous. It displays modest but pronounced orchestral depth; a touch of hardness; a clean, well-balanced frequency range; some strong, well-focused bass outbursts; and clear, sparkling highs. It's worth a listen. Also, various other orchestral selections and transcriptions. Jonathan Carney, Royal Philharmonic Orchestra. Royal Philharmonic Masterworks RPM 28900. German organist and composer Johann Sebastian Bach (1685-1750) wrote music for practically every instrument, ensemble, and occasion of his day, with the preponderance of material for the organ, as one might imagine. The present album offers a sampling of his most-popular output, a few of the pieces adapted for modern orchestra. Although it makes one wish for longer or more-complete Bach material, one cannot deny the attraction of the works or their presentation. Things start off with Bach's Toccata and Fugue in D minor for solo organ, only the disc never names the soloist. This seems a pity, he or she is so very good. The performance is at once vivid, lively, colorful, and exciting. Wonderfully recorded, it's a thrilling experience. Next is the Cantata No. 51, "Jauchzet Gott in allen Landen." Here we get only the opening movement, with again exciting and engaging contributions from trumpet and soprano, the soloists again unnamed. Then, there's the Cantata No. 140, "Wachet auf," the most-familiar movement done up in an arrangement for modern ensemble. It's lovely, with Maestro Jonathan Carney letting it glide along like a dove on wing. Carney's way with the Allegro from Bach's Brandenburg Concerto No. 4 is light, lilting, and completely charming; as is the "Air on the G String" from the Orchestral Suite No. 3. Like the other selections on the program, there is nothing old-fashioned about the interpretation, yet Carney takes his time and allows the music to unfold easily, without getting all crazy on us as some so-called "authentic" performances do. The Allegro from the Keyboard Concerto No. 1 in D minor follows, where we find both Bach and Carney in a dramatic mode, with Carney making the most of the situation in a rousing rendition. In contrast, the Cantata No. 208, "Sheep may safely graze," is bucolic, pastoral, and perfectly delightful under Carney's deft, dexterous, graceful direction. Continuing on, we get the last three movements of the Suite No. 2 in B minor for Flute, Strings and Continuo. It is chirpy, bouncy, and perhaps for Bach a little flamboyant; it is also quite infectious. Alas, the poor flutist goes unnamed. 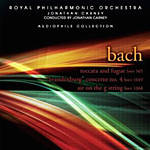 We couldn't have a representative selection of Bach's music without the Cantata No. 147, "Jesu joy of man's desiring," no doubt one of the composer's most-familiar works. Carney gives it a romantic, close to sentimental treatment that is, nevertheless, considerably attractive. The album ends with the Allegro assai from Bach's Brandenburg Concerto No. 2. It provides a properly chipper conclusion to the festivities. As I said earlier, all of this material makes one want to hear the conductor, orchestra, and soloists in longer, more-complete pieces by Bach. These highlights only serve to whet one's appetite. The sound, produced in 2007 and released by Allegro Corporation in 2011 in the Royal Philharmonic Masterworks Audiophile Collection is big, sparkling, big, powerful, big, wide-ranging, big, dynamic, big, and did I mention big? Even played softly, the music gives one the feeling of a spacious orchestral presence or a huge, spacious organ or whatever. While the upper midrange is a tad forward and the upper bass a mite thick, the overall effect is smooth and realistic, especially with the inherent ambience of the acoustic providing so pleasant a bloom. Music of Glinka, Borodin, Rimsky-Korsakov, Dargomyzhsky, and Mussorgsky. Evgeny Svetlanov, Orchestra of the Bolshoi Theatre of the USSR; USSR State Academic Symphony Orchestra. Melodiya MED CD 10 01824. 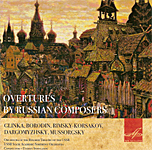 Composers intend for overtures to be curtain raisers, and who better to perform a collection of Russian overtures than a Russian conductor, Evgeny Svetlanov, and a pair of Russian ensembles, the Orchestra of the Bolshoi Theatre of the USSR and the USSR State Academic Symphony Orchestra. Drawn from Russian Melodiya's back catalogue of recordings, the nine overtures on the disc make for a stirring, if somewhat brief (a little under sixty minutes), album of entertainment. Things begin with the Ruslan and Ludmila overture by Mikhail Glinka (1803-1857). This is a traditional opener for albums of Russian music, and I must say it never fails to get things off to a rousing start. Under Maestro Svetlanov it exhibits plenty of energy and verve, with the Bolshoi Orchestra in top form. Following that, we get Glinka's overture to Ivan Susanin, a longer, more somber, more melodramatic piece and, for most listeners, I'd guess, a less-familiar one. Done with the USSR State Academic Symphony, it shows a good deal of spirit and red-blooded Russian flair. Next up is the overture to Prince Igor by Alexander Borodin (183301887). After a slow, relatively soft introduction, the music breaks out into a grand, heroic theme, followed by echoes of the "Polovtsian Dances." Svetlanov takes the middle section at a lilting, dance-like pace that is quite fetching. Modest Mussorgsky (1839-1881) wrote "Dawn on the Moscow River" to introduce his opera Khovanshchina. It's lovely, and Svetlanov ensures that we hear all the picturesque sounds of daybreak in the city, complete with church bells. After that, we get four overtures by Nikolai Rimsky-Korsakov (1844-1908): the little introduction to Sadko, then May Night, The Tsar's Bride, and The Maid of Pskov. Of the four, probably the most evocative is May Night, delicately handled by Svetlanov, and the most "Russian" sounding The Tsar's Bride, filled with contrasting light and dark passages that Svetlanov highlights brilliantly. The program ends with the overture to Russalka by Alexander Dargomyzhsky (1813-1869). It contains a little of everything, from a fairly theatrical opening to a busy central section to a slight, breezy melody to a most-passionate ending. The music brings the album to an appropriately grandiose conclusion. As I say, the disc provides an entertaining hour of music, although I wouldn't say it displaces my favorite album of Russian music by Georg Solti and the London Symphony (Decca or LIM). Solti is not only more exciting than Svetlanov in a similarly themed album, the Decca engineers recorded him and the LSO magnificently. With classical music recordings, there are always choices, a blessing and a curse, especially for those folks who hate making decisions. Back in the Sixties and Seventies I admit I never cared much for the sound of Russian Melodiya LP's. They often seemed too thin, harsh, and bright for my ears. Not so with the remastered recordings on this 2011 CD release. They derive from 1963-1977 sessions, and while they are not state-of-the-art, they do sound more than acceptable, if still a tad thin. There is a particularly fine sense of hall ambience about all of the music, the older recordings actually displaying a greater depth of image, the newer ones a trifle smoother and wider spread out. My only minor qualm would be that we might have gotten some better-extended frequency extremes, which would have given the sonics a little more low-end punch and high-end sparkle. The first three releases in the partnership with ArkivMusic--available digitally August 2 and on CD August 30--include recordings of Beethoven and Schubert featuring Uchida, as well as vocal chamber scores by Respighi, Cuckson, and Shostakovich, and quartets by Debussy and Ravel. Each summer since 1951, some of the world's most distinguished musicians and exceptional young artists have gathered for seven weeks on the campus of Marlboro College in southern Vermont to create a community like no other: the Marlboro Music School & Festival. To coincide with the festival's 60th anniversary month, the Marlboro Recording Society begins a series devoted to releasing memorable live performances from the festival never previously issued commercially. These concert recordings--dating from past decades to the present day--have been personally selected by the artistic directors of Marlboro, esteemed pianists Mitsuko Uchida and Richard Goode. The release of this series is in partnership with ArkivMusic, the first three albums available digitally August 2 and on CD August 30 (via Naxos Distribution). Further releases will come quarterly. The first three releases in the "Live from the Marlboro Music Festival" series present a mix of veteran artists and on-the-rise young musicians. The first album combines warmhearted performances of Mozart's String Quintet K. 593, Beethoven's "Archduke" Piano Trio, and the slow movement of Schubert's Piano Trio D. 929, all featuring David Soyer, the late founding cellist of the Guarneri String Quartet, and the last two works with Mitsuko Uchida. 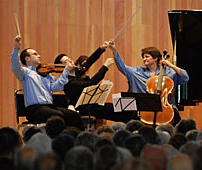 The second album features a singular collection of vocal chamber music: Respighi's expansive Shelley setting Il Tramonto and Shostakovich's alternately touching and piquant Songs on Hebrew Folk Themes, as well as American composer Robert Cuckson's Der gayst funem shturem (The Spirit of the Storm), a 2004 setting of poems by Yiddish writer Binem Heller that mourn the loss of the Jews of Warsaw. The third recording pairs passionate, elegant takes on the string quartets of Debussy and Ravel, plus the latter composer's beautifully impressionistic Introduction et Allegro. "There is something very special about the sense of community at Marlboro that's really touching and wonderful," says Goode. "It's because the musical experience and the personal experience come together, so it gets a sort of cumulative energy and warmth--and that's a lovely thing." Uchida adds: "That's the one factor that is most important at Marlboro. We live together, we eat together, we make music together--and we breathe music. I travel so much during the season. . . Where else on earth are you with the same set of people for five weeks, six weeks, seven weeks? You don't have it in today's world, so this changes you." According to ArkivMusic general manager Jon Feidner, the partnership between the Marlboro Recording Society and ArkivMusic is "a great opportunity to share the rare atmosphere of Marlboro with classical music lovers everywhere. You can really hear how special that warmth and intimacy is in these performances." In addition to the launch of the Marlboro Recording Society Label, ArkivMusic has reissued over 20 recordings from Marlboro through its on-demand program, all from Sony Music, including four reissues this month which were previously only available on LP. For more info, you can visit their Web site at www.ArkivMusic.com/Marlboro. Bruno Weil, Tafelmusik. Analekta AN 2 9831. 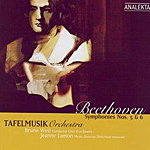 Beethoven wrote both his Fifth and Sixth Symphonies in 1808 and premiered them together at a concert that any music lover today would give his right arm to have attended. The concert also included a part of the Mass in C, a piano solo, the Choral Fantasy, and the Fourth Piano Concerto, with Beethoven himself at the keyboard for all of the piano work. The present disc does not contain all of that music, just the two symphonies, but I wonder why no enterprising record company hasn't thought of issuing a two-disc set that duplicates that famous occasion. Anyway, the period-instruments' group Tafelmusik play the two symphonies under the guidance of conductor Bruno Weil. I might have preferred the group's regular music director, Jeanne Lamon, but Weil is a fine conductor in any case. He does something with the "Pastoral" Symphony that most conductors don't manage: He directs a brisk, vigorous, ostensibly "authentic" account without seeming rushed. By comparison, Norrington's groundbreaking period-instruments' rendition (EMI) appears slightly hurried. Weil's Sixth moves along at a healthy clip, yet it seems relaxed; not leisurely, mind you, but tranquil, with the storm nicely rambunctious and the concluding "Shepherd's Hymn" appropriately joyous and consoling. In contrast, Weil's direction of the Fifth Symphony seems mundane. It, too, moves vigorously along, yet it feels as though it's proceeding too quickly to have much impact. The reading seems almost perfunctory by comparison to people like Kleiber (DG) and Reiner (RCA) on modern instruments and Norrington on period instruments, who make much more of the fate motif and create much more of an impression throughout, especially at the end where the big climax shouts down all else. One might describe Analekta's sound as either ultrasmooth or ultrasoft, depending upon how generous one wants to be. If your system is at all aggressive or bright, the sound will be ideal; if your system is at all subdued, it may sound mushy. There's nothing wrong with the stereo spread, tonal balance, or orchestral depth, however, all of which are excellent. Also, Songs; Metamorphosen. Joan Rodgers, soprano; Jan Latham-Koenig, Orchestre Philharmonique de Strasbourg. Avie AV2172. 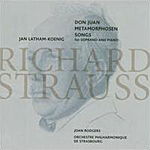 The works on this 2011 Avie release span almost the whole of Richard Strauss's lifetime (1864-1949). The album begins with the tone poem Don Juan from 1889, a piece that pretty much put Strauss's name on the map; it continues through two sets of early lieder; and it finishes up with the tone poem Metamorphosen from 1945, written just a few years before his death. The album makes for an interesting and enlightening listen. Maestro Jan Latham-Koenig leads the French-based Strasbourg Philharmonic Orchestra (he was the orchestra's Music Director from 1997-2003) in all three sections of the program, his work with Don Juan setting the tone for the rest of the disc. Don Juan is, of course, a swashbuckling piece of music that probably influenced any number of later film composers like Erich Wolfgang Korngold and even John Williams. Appropriately, Latham-Koenig plays up the theatrics for maximum effect, without abandoning the more-intimate moments of the score. It's quite impressive and generates a good deal of excitement. Soprano Joan Rodgers, accompanied by Latham-Koenig on piano, performs eight Strauss songs--four from his Op. 10 ("The Saffron Crocus," "All Soul's Day," "Georgine," "Concealed") and four from Op. 24 ("Meeting," "Red Roses," "The Rose Awoken," "Tomorrow!"). They are lovely, the earlier ones more overtly wistful and emotive than the later ones, which tend to lean more to Strauss's operatic tastes. In any case, Ms. Rodgers displays a strong and expressive voice. Strauss wrote Metamorphosen as one of his last major works and composed it for twenty-three solo strings. He took as his inspiration the poems and writings of the first-century Roman poet Ovid and the nineteenth-century German poet Johann Goethe. Music critic Michael Kennedy called it "a masterpiece of romanticism in its death agony...an epilogue for an old era." Certainly, there is a good deal of sadness, mournfulness, in the piece; we have to remember Strauss penned it at the end of the Second World War, not a happy time even for the victors. Despite its melancholy, which the conductor and orchestra render without much sentimentality, the work includes many reflections of the composer's early orchestral output. It was a sweet way for Strauss to go out, and it makes a suitable and memorable way to conclude the disc's program. Don Juan and Metamorphosen derive from recordings made in 2001 in the Salle Erasme du Palais de la Musique et des Congres de Strasbourg. The songs come from 2008 at Henry Wood Hall, London, England. Both recording venues work well with the material. Ultimate midrange transparency is perhaps a touch lacking in the orchestral selections, with the treble a bit soft and the bass a bit light. Still, it's a fairly natural sound overall, with an admirable smoothness about it. The songs project a clean, clear voice and accompaniment and are a pleasure on the ear. The Music of Bela Bartok. Jake Schepps, banjo; with string band. Mighty Fine Records 1003. The term "classical bluegrass" never quite meant what it does on this album, An Evening in the Village: The Music of Bela Bartok. Banjo exponent extraordinaire Jake Schepps and eight of his string-band friends on violin, mandolin, guitar, cello, and bass play the music of Hungarian composer Bela Bartok (1881-1946) as you've probably never heard it before. And the surprising thing is, at least some of it works. The idea is that since Bartok found many of his melodies in traditional Hungarian, Romanian, and Bulgarian folk tunes, why not adapt them for traditional American folk instruments. However, while it's a novel idea, it does have it limitations. I mean, why not just play the music on traditional European folk instruments instead of trying to accommodate them to an American idiom? Yet, where would the fun be in that? In any case, the result of all this fussing about with the music of different cultures winds up something more American-sounding than middle European, which is doubtless the effect Schepps had in mind. He's playing largely for an American audience, after all, at the same time he'd like to appeal to classical-music fans of any country, so the fusion makes sense from a purely commercial standpoint. 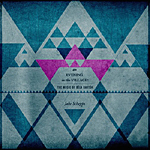 The opening track, "An Evening in the Village," based on Bartok's Hungarian Sketches, sets the tone with its clearly bluegrass roots and vaguely foreign overtones. Will the fruits of this mix satisfy both camps? Who knows. Surely, it is fascinating music and well played, so there is no discounting those qualities. Some of the numbers sound Western, some of them pure bluegrass, some of them pure blues, some of them jazzy, some of them conventional, some of them curious, some of them sprightly, some of them melancholy, some of them gypsy-like, some wistful, some melancholy, some joyous, some romantic, some modern. There is without question a little of everything here for everyone, yet it boils down to one's appreciation for traditional American acoustic music because no matter what the melodies or arrangements involved, that's how it's going to come off to most ears. Recorded in Nashville and Colorado between April and November of 2010, the sound appears fairly close up, yet without any stridency or clamor. Instead, if anything, the strings seem a little too smooth, even soft, for the relative distance at which the engineers miked them. The transient response is quick, though, and plucked notes have a strong, well-defined impact. The bass is especially prominent, giving the overall sound a slightly heavy feeling, set within a somewhat resonant acoustic. North Bethesda, MD, June 28, 2011--This summer, the National Philharmonic will engage some of the area's most promising young musicians through its String and Choral Institutes. The institutes, for middle/high school string players and high school/college vocalists, nurture young talent and teach musical skills and techniques while preparing the participants for a performance. In addition, the National Philharmonic offers the Adult Summer Chorale Institute, whose participants work with National Philharmonic Chorale Artistic Director Stan Engebretson. "Nurturing the next generation of audiences and performers is at the heart of our mission in the community," said National Philharmonic's Music Director and Conductor Piotr Gajewski. The High School/College Summer Choral Institute (July 18-22, 2011, Monday-Friday from 2:30-8:30 pm, Montgomery College, Rockville Camapus) offers young singers an intensive, weeklong immersion in voice building, musical interpretation and performance techniques. The institute, produced through a partnership between the National Philharmonic and Montgomery College Institute, is led by Dr. Engebretson, Dr. Molly Donnelly, a Professor of Music at Montgomery College, and Victoria Gau, Assistant Conductor of the National Philharmonic. The High School and College Choral Institute Chorus will sing works ranging from the beautiful Domine ad adjuvandum me by the 18th century composer Giovanni Martini to rhythmically compelling world music such as Niska Banja by Nick Page. This group will also join the adult singers in John Rutter's uplifting set of spirituals, Feel the Spirit. The week culminates in a free public concert at Montgomery College School, Rockville Campus on Friday, July 22, 2011 at 7:30 pm. The Adult Summer Choral Institute (July 12-12, 2011, on Tuesdays and Thursdays from 7-9 pm, Montgomery College) offers adult singers (college age and over) from around the area an opportunity to sing with members of the National Philharmonic Chorale under Dr. Engebretson in four intensive rehearsals over two weeks. The Adult Choral Institute will sing movements from Mozart's Solemn Vespers, "The Spheres" from Sunrise Mass by Ola Gjeilo and John Rutter's set of spirituals, Feel the Spirit. The week culminates in a free public concert with the High School/College Choral Institute at Montgomery College School, Rockville Campus on Friday, July 22, 2011 at 7:30 pm. The Summer String Institutes (High School String Institute August 1-5; Middle School String Institute August 8-12, Bethesda Presbyterian Church) immerse talented and aspiring middle school and high school string musicians in an intensive week of mentoring, chamber music coaching, individual lessons and rehearsals led by National Philharmonic Music Director & Conductor Piotr Gajewski, Philharmonic Assistant Conductor and String Institutes Director Victoria Gau, musicians of the Philharmonic and other well-known music pedagogues. The High School String Institute will study and perform works by Grieg, Mozart, Benjamin Britten and Vivaldi; the Junior High School will study and perform works by Jean Berger, Peter Warlock and Mozart. This year marks the 14h anniversary of the High School String Institute and the 13th year of the Middle School String Institute. The High School String Institute will culminate in a free public performance at the Bethesda Presbyterian Church, 7611 Clarendon Rd, Bethesda, MD on Friday, August 5 at 7:30 pm and on Friday, August 12 at 7:30 pm for the middle school session. For more information on the Summer String and Choral Institutes, please visit nationalphilharmonic.org. Seattle, WA – Ludovic Morlot, Seattle Symphony's new Music Director, has accepted a second position as Chief Conductor of one of Europe's leading opera houses--La Monnaie/De Munt--in Brussels, Belgium. The five-year appointment, commencing on January 1, 2012, will allow him to broaden his career as a conductor of opera, and add to his already impressive work with symphony orchestras. During his first full season at La Monnaie, starting in the fall 2012, his programs will include Alfred Bruneau's Requiem as well as his first performances of Debussy's Pélleas et Mélisande. Commenting on Morlot's new European position, Seattle Symphony Executive Director Simon Woods remarked, "We are thrilled by Ludovic's appointment to one of Europe's top opera houses. His selection to this position demonstrates the growing international profile of our amazing new Music Director. We can't wait to welcome him to the podium for the start of our new season in September." Peter de Caluwe, General Director of La Monnaie, noted, "I am proud of Ludovic Morlot's nomination as he is, without a doubt, one of the greatest talents amongst the new generation of conductors. I am pleased that an artist with such an impressive international reputation will be at the helm of the Monnaie Symphony Orchestra. His experience with the major international orchestras will give a positive input for our musicians. I look forward to our future collaboration together in both orchestral and operatic performances." Ludovic Morlot: "It is such a privilege to be associated with La Monnaie as its new Chief Conductor. I am very grateful to be given the opportunity to collaborate with this wonderful orchestra in both concert and opera productions and to work closely with Peter de Caluwe and his excellent artistic and administrative teams. I am very much looking forward to working with the players, singers and the many individuals who help make this opera house so successful. I feel extremely honored and excited as we embark on this musical journey together." Morlot, his wife and two young children are currently moving to their new Seattle home where he takes up his position as Music Director of the Seattle Symphony on September 1. Morlot's first season will see him leading the Orchestra in more than a dozen different programs, including Beethoven's "Eroica" Symphony, Stravinsky's The Rite of Spring, Rachmaninov's Symphonic Dances, a gala concert with Renée Fleming, and, as a season finale, performances of Berlioz's The Damnation of Faust with Ruxandra Donose, Eric Cutler and David Wilson-Johnson. He has also programmed and will conduct a unique program, Sonic Evolution, on October 18; this concert celebrates the past and future of Seattle's music scene. French musician Ludovic Morlot is quickly establishing a reputation as one of the leading conductors of his generation. During the 2010–2011 season, he conducted Poulenc's Les Mamelles de Tirésias at Opéra National de Lyon and Opéra Comique in Paris. Morlot has also collaborated with many other distinguished singers including Barbara Hannigan, Dawn Upshaw, Jessye Norman and Thomas Hampson. He also has made debuts with the Royal Concertgebouw Orchestra, Czech Philharmonic and NDR Symphony Orchestra Hamburg, and next season, he will conduct the Orchestre National de France for the first time. Trained as a violinist, Morlot studied conducting at the Royal Academy of Music in London and then at the Royal College of Music as a recipient of the Norman del Mar Conducting Fellowship. Morlot was elected an Associate of the Royal Academy of Music in 2007 in recognition of his significant contribution to music. 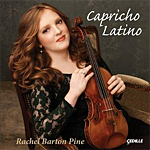 Rachel Barton Pine, violin. Cedille Records CDR 90000 124. Violinist Rachel Barton Pine is Cedille Records' biggest-selling artist, and for good reason. She plays with virtuosic flair yet always with refined and cultured style. For instance, her Cedille recording of the Beethoven Violin Concerto with Jose Serebrier and the Royal Philharmonic Orchestra is among my favorites. On the present disc she essays a selection of music by Spanish, Central American, and South American composers, arranged for solo violin. As we might expect, it's beautiful, strange, exciting, and always captivating. On fourteen tracks, Ms. Pine plays the music of composers Isaac Albeniz, Roque Cordero, Cesar Espejo, Manuel Quiroga, Eugene Ysaye, Louis Jorge Gonzalez, Jose White, Francisco Tarrega, Joaquin Rodrigo, Jose Serebrier, Astor Piazzolla, and Alan Rideout. Several of the works are world-première recordings for the arrangements: Albeniz's Asturias (Leyenda), Cordero's Rapsodia Panamena, Espejo's Prelude Ilberique, Gonzalez's Epitalamio, White's Etude No. 6, and Serebrier's Aires de Tango. Albeniz's Austurias, arranged by Ms. Pine herself, shows her dexterity on the violin as well as her musical expressiveness. Additionally, she imbues the music with a lusty sensuousness and brawny ruggedness that is quite beguiling. While some of the music on the disc the composers wrote specifically for solo violin and many others they wrote for piano or guitar, it makes no difference; all of it sounds entirely appropriate on the violin as though the composers wrote all of it for the instrument. The Quiroga piece, Emigrantes Celtas, is especially nostalgic and haunting. Then, his music in Terra!! A Nosa!! sounds positively festive and not a little Scottish. Jose White's Etude No. 6 is more mainstream than most of the other works on the album and strikes a Romantic note in the program. Tarrega's familiar Recuerdos de la Alhambra is always welcome, even if Ms. Pine plays it a brisk pace. Serebrier's Aires de Tango, which the conductor-composer dedicated to Ms. Pine, also comes off felicitously. Finally, I enjoyed the concluding piece, Rideout's Ferdinand the Bull, with noted actor Hector Elizondo narrating the famous story to Rideout's music. It makes a sweet and effective ending to the proceedings. One of my favorite audio engineers, Bill Maylone, recorded Ms. Pine in the Fay and Daniel Levin Performance Studio, WFMT, Chicago, Illinois, between July 2009 and January 2011. The sound is excellent, the miking set up at an ideal distance to capture the instrument in precise detail, yet with a well-judged air around it, the warm ambience of the acoustic imparting a lovely glow to the violin. This is reach-out-and-touch-it sound that is sure to please any music lover or audiophile. Extensive booklet notes cap off a rewarding package from Cedille Records.